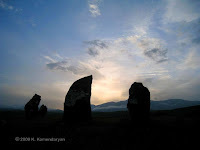 KARAHUNGE, STONEHENGE AND ARMENIAN DRAM. There is no need to introduce British Stonehenge, but just a few people even in Armenia are aware about Karahunge megalithic complex (“Zorats Karer” ancient site), which, however, is pretty noticeable–its wings span for 350 meters. On the other hand, just a few years ago Karahunge elevated attention of numerous scientists: the archaeologists, the astrophysicists and the historians. 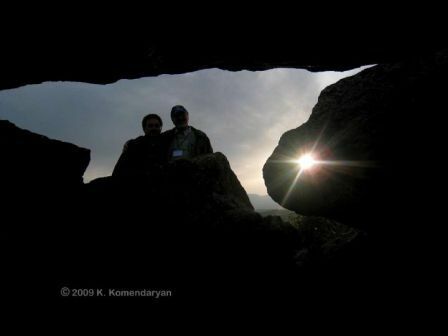 Professor E. Parsamyan, one of Karahunge researchers, figured out that Karahunge is about 4000 years old, and in his turn the Academician-astrophysicist P. Heruni deduced that the observatory has been erected 7500 years ago. Anyway, it is accepted by all, that Karahunge is older than Stonehenge. 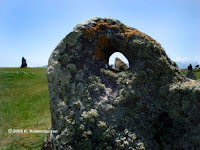 There is a similarity between "Karahunge" (there is also a village with the same name) and "Stonehenge" names, the first part of which in the both languages means the same–“stone”! 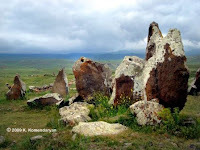 Then, there is nothing in English, which stands for “henge”, but easily is traced in Armenian dialect local to the site. Moreover, Armenian and English as languages of Indo-European family have a lot of words of common origin. So, does it mean that people, who inhabited Armenian Highlands, might communicate with British islanders? Believe or not, but some historic facts and logical deduction lead to that. Some may argue that the Armenian Highlands and the British Islands are too far from each other and the contemporary islanders have nothing common with Armenians. Then recall please the history of ancient cultures' development and their spread around the globe. For instance, ancient Egyptians and Maya might cross the Atlantic Ocean 1, the possibility of which proved Thor Heyerdahl sailing from Africa to America on “Ra” papyrus boat. And finally, the ancient English “Anglo-Saxon Chronicle” stated: “The island Britain is 800 miles long and 200 miles broad. And there are on the island five nations: English, British, Scottish, Pictish and Latin. The first inhabitants were the Britons, who came from Armenia and first peopled Britain southward”. 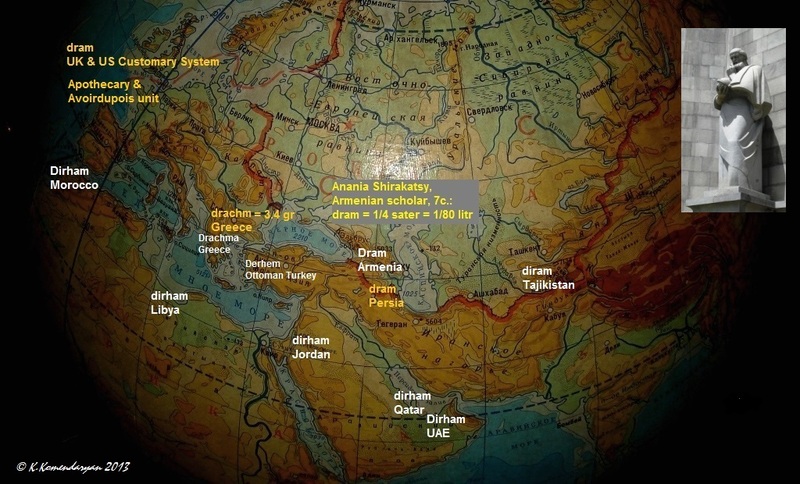 The genetics studies also revelead some astounding facts: as it is stated "The geographical distribution of the R1b (Y-DNA) haplotype is such that it is shared by Armenians and two other populations from the Caucasus." And this map clearly shows the spread of the R1b (Y-chromosome haplogroup) from the Armenian Highlands towards the Western Europe and northwards. Armenian Dram is the currency of Republic of Armenia, but what it has to do here? Well, let’s trace the similarities in the names of currencies of the countries from East to West: Arabic Dirham, Armenian Dram, Ottoman Dirhem, Greek Drachma, and … in the name of weight unit (mass, volume of liquid) ‘dram’ or ‘drachm’ in the contemporary Avoirdupois and in the old Apothecary systems used at least in UK, USA, and long time ago in Persia. It is known that one of the old means of payment was a definite amount of precision metals, or an amount of those metals in the coins. English speaking countries inherited ‘dram’ (‘drachm’) as a small weight and Armenia as the means of payment. About the same happened to ‘pound’, which now stands for currency in Britain and for weight in America. Thus, the usage of the words and the transformation of their meaning took place at the time of trade and culture exchange between the countries long time ago. 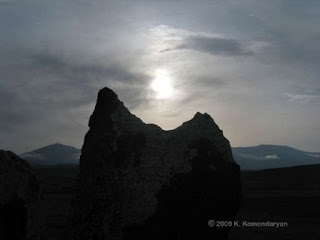 Obviously, the very ancient astronomers (may be of Karahunge-Zorats Karer as well) possessed such knowledge, as the technique of navigation by sea, orientation on the lands and marking the special days of the year. Then you may easily imagine how the nations contacted each other, how the merchants traded goods for dram along the Great Silk Road, and how the caravans, passing through the Armenian Highlands and Karahunge, connected East and West. 2 ‘Ayas’ was the main medieval Armenian seaport of Cilician Kingdom in East Mediterranean.